In a recent article I looked at how we can grade T20 batsmen in both domestic and international matches around the world, using innings difficulty, as well as averages and strike rate. As mentioned, being able to do this has numerous benefits, not least the fact that having a solid sample of data on all players makes it possible for modellers to grade players and work out combined team strengths, with a view to exploiting incorrect bookmaker/Betfair prices in the pre-match/in-play betting/trading markets. In addition to this, teams who possess accurate data will also be able to use it to select teams and batting orders, as well as to evaluate which overseas players to sign, or in player drafts. This is also the case for bowlers, and without giving too much away at the start of the article, it looks like many teams - both at domestic and international level - are completely unable to work out the levels of certain bowlers. Readers of the previous articles I've also written may not be entirely surprised at this. In various articles I made the point that the England selectors look to be making many mistakes and clearly ignore performances of 'certain' players. Without making the article too long, I'll link here again the Grading T20 Batsmen article which explains the formulas that I use, and also explains mean differential concepts. As there were a number of players with a combined positive differential of 1.22, there are 22 players listed here, with a number of surprising names as well as those who many are likely to expect to be near the top. Expected names would certainly include Lasith Malinga, Sunil Narine, Ravichandran Ashwin, Mitchell Starc, Samuel Badree and Adam Zampa, as well as the superb Bangladesh bowler Mustafizur Rahman. However, readers may be shocked to see Australian left arm paceman Jason Behrendorff at second in the list and it looks like the Aussie selectors have missed a trick, picking much worse rated quicks than Behrendorff. Furthermore, and a recurring theme, is the inability of the England selectors to pick the right players - based on data - to do the job. Benny Howell's numbers have been superb for a few years now and he lies 5th in the table - he's also a very useful lower order hitter with a decent strike rate, and could be a player who could step up to international level or be a cheap pick for a foreign franchise during the English off-season. Should Benny Howell be given a chance by England? Veteran Rikki Clarke's superb economy sees him in 10th, whilst a random name to many - Tom Smith - lies in 14th. The Gloucestershire slow left armer has shown really strong stats to be in this table. Perhaps more encouraging from an England standpoint, Tymal Mills, the great hope of English T20 pace bowling, was rated equal 20th in the world. However, there were a lot of statistically very poor bowlers who seem popular with T20 franchises around the world. 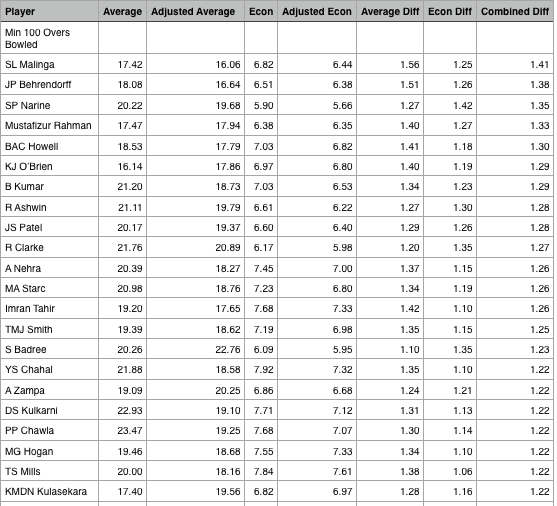 The above players had the worst mean differential of all the bowlers who had bowled 100 or more overs in the time frame of the sample. This doesn't necessarily mean that these are the worst bowlers in T20 (there were a number in T20 Blast in particular, with shocking numbers, but without the sample size requrired), but the bowlers in the table above were flagged up as the worst bowlers who have a considerable sample size. Almost all of the bowlers above have, at some point, received at least one franchise contract from a foreign team. Kyle Abbott and Darren Sammy came off worst in the numbers, with both recording well in excess of the T20 mean for both average and economy. Based on this data, it isn't a surprise that the West Indian selectors are looking at replacing Sammy, as discussed in this article. Sammy's countryman Suliemann Benn, James Tredwell and Mashrafe Mortaza all had adjusted averages over 40. All had reasonable economy rates but very poor averages, indeed, whilst Reece Topley and Graham Napier were the opposite in that they were expensive but took wickets. Quite a few of the bowlers in the list are all-rounders, and the data looks like the role of all-rounders, particularly those who are neither at least at average level in either batting or bowling, is questionable. Obviously quality all-rounders will be invaluable in any format of cricket, but all-rounders who are neither good with bat nor ball are almost certain to hinder a team, as opposed to help it. A further article will look at all-rounders in the near future.